Gain college credit using MathMedia Trigonometry software to pass the CLEP tests...! The Subject Examination in Trigonometry covers material usually taught in a one-semester college course in trigonometry with primary emphasis on analytical trigonometry. 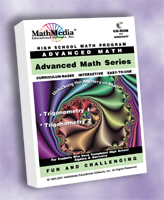 MathMedia Trig 1 & 2 programs cover all the exam topics you will encounter. You must practice the software and any other preparation materials you choose WITHOUT A CALCULATOR. You will not be able to use one on the CLEP exam. More than half the exam is made up of routine problems requiring basic trigonometric skills; the remainder involves solving nonroutine problems in which candidates must demonstrate their understanding of concepts. The exam includes questions on trigonometric functions and their relationships; evaluation of trigonometric functions of positive and negative angles; trigonometric equations and inequalities; graphs of trigonometric functions; trigonometry of the triangle; and miscellaneous other topics. It is assumed that the candidate is familiar with currently taught trigonometric vocabulary and notation and with both radian and degree measure. The exam places little emphasis on arithmetic calculations, and the use of calculators and other computing devices is not permitted during the exam. Approximate Percent of Examination 30% Trigonometric functions and their relationships Cofunction relationships Reciprocal relationships Pythagorean relationships such as sin2 + cos2 = 1 Functions of two angles such as sin Functions of double angles such as cos2 Functions of half angles such as sin Identities 20% Evaluation of trigonometric functions of angles with terminal sides in the various quadrants or on the axes, including positive and negative angles greater than 360° (or 2p radians) 10% Trigonometric equations and inequalities 10% Graphs of trigonometric functions 10% Trigonometry of the triangle including the law of sines and the law of cosines 20% Miscellaneous Inverse functions (arc sin, arc cos, arc tan) Trigonometric form (polar form) of complex numbers including DeMoivre's theorem. You should print the above formulas from the MathMedia Trig 1 & 2 software programs so that you can use the hardcopy as flashcards. You must memorize the formulas...! Within the subject matter described above, questions on the exam require candidates to demonstrate the abilities given below in the approximate proportions indicated. Solving routine problems involving basic trigonometric skills (about 60 percent of the exam) Solving nonroutine problems requiring an understanding of concepts and the application of skills and concepts (about 40 percent of the exam).